One of the best things about my job at Cycling Plus Malaysia, is the occasional local route features that we do. Rounding up the mid-week ride gang, we get the chance to pack up and head out of state to test a different cycling spot. It’s often a short workcation of sorts, since the ride usually involves a nice bit of exploration wherever we go. The best part? I don’t even have to take leave to do it, since it is technically work. We had the chance to do such a trip earlier this year, thanks to a collaboration with Volvo Malaysia, which supplied us two brand spanking new XC60s for the drive. For the best drive to ride experience we opted for Terengganu, since the road to the east coast is long and mostly straight, and provided the perfect testing ground for the two vehicles. To get to Terengganu, it was a long haul journey of nearly 500km, stretching about six hours on the East Coast Expressway (ECE). Head northeast towards Gombak and take the E8 or winding Karak Highway to Kuantan/Genting Highlands. Keep going until the ECE all the way to the end of the recently completed second phase of the highway. After what seemed like forever, we reached the Kuala Terengganu exit, and continued driving along the Terengganu state road towards Kampung Penarik. This stretch - Pantai Penarik - has some of the most beautiful coastlines in the state, complete with coconut trees swaying in the sea breeze, clean sandy beaches and quaint traditional wooden Malay houses. Our chosen route was a more than 50km ride each way; a return trip would stretch more than 100km. We planned the ride so that the group could cycle parallel to the state’s coastline so that we could enjoy the seaside views. This is something that we don’t get to do much back home, since we are closer to the west coast of Peninsular Malaysia, where the beaches come nowhere near rivalling those on the east. We started and ended our ride at Sekeping Penarik, a charming homestay we found on airbnb that was right by the beach. From the homestay we started before the sun rose, grabbing a quick bite of nasi dagang as the locals do, at Kedai Makan Selera Pantai. After our breakfast, we soon set off as the sky began to lighten, with the overcast conditions telling us that it was a good day to spend on our bikes. There were many photo stops along the way, since the views were impossible to resist. Not forgetting the fact that we were technically on duty, and documenting our ride was part of our task for the day. After approximately 9kms of riding along the quiet beachside road with the sea flanking us on our left, an oil pipeline that cut across our path forced us to head out to the main road instead. Despite the amount of traffic along the route we were never really unnerved by passing cars, since most gave us a wide berth while overtaking. Somewhere around the 45km mark the sun began to peep out from behind the cloud cover, just in time for us to take a break at a seaside stall. Kedai Bihun Sup Telur Pantai Tok Jembai had delicious coconut jelly - a godsend for us cyclists looking for ways to rehydrate and replenish our electrolytes. The maggi goreng here isn’t too bad either, and the bill was so ridiculously cheap that everyone from KL did an audible double take when they were told the final price charged to our table. The location is nearby Universiti Malaysia Terengganu, making it a favourite haunt for students. There are also army facilities in the surrounding areas, and you will often see truckloads of young recruits being ferried around on the road. They can also be seen frequenting the same food stalls where the students and locals go to eat. We reluctantly had to continue on our way, reapplying sunscreen before making a move, since the cloudy weather had finally given way to a dazzling mid-day sun. It was already noon by then, and we spent the next 10km fighting headwinds and riding in the sun along the Sultan Mahmud Airport, circling around the runway that juts out into the sea. We soon found ourselves a nice spot to nap under pine trees, with a view of the now azure sea to lull ourselves to sleep. Refreshed, we soon pressed on and found ourselves in Pulau Duyong, where the traditional boatmakers of Terengganu were nowhere in sight, leaving us to wander around their workspaces. This was also the perfect spot for snapshots of the Crystal Mosque from across the waters, the views made more spectacular by the light of the sun bouncing off the gentle waves. To briefly escape the heat, we found a local food stall to have a small lunch of nasi campur, namely mixed rice and the accompanying buffet of meats and vegetable sides. It was another much needed break, since the road in and out of Pulau Duyong is fairly busy, with flyovers that are completely exposed to the sun. From there we started on the scenic route back to our starting point, making a beeline for our next checkpoint some 35km away at Kampung Merang. Bayu Keropok Lekor was our destination, one of the most popular stalls selling keropok lekor by the bag full. It received five star ratings and rave reviews online, and definitely did not disappoint. The stall had a bustling production line that didn’t stop churning out both fried and uncooked keropok lekor. Most of the clientele were there for bulk take-aways; our group was among the very few cramming into one of two tables to enjoy ours on site fresh from the kuali, crispy at first bite yet fluffy inside, and piping hot. As we wrapped up our teatime snack, the sun began to dip further down the horizon, signalling that it was time for us to continue our journey - approximately another 20km left to Pantai Penarik. As the sun was setting, we turned back into the coastal path that links the small villages, our last chance to enjoy the seaside views in the waning light. Darkness finally fell as we had 10km left to go, and we were glad for our fully charged lights on the kampung roads. It was a pleasant last stretch if not for our fatigue, and after 12 hours on the bike we were infinitely relieved to reach the homestay, where we spent the rest of the evening relaxing on the verandah listening to the waves, after a well deserved dinner of baked fish. There are a ton of homestays and chalets that you can choose from along this stretch of Terengganu’s coastline. However, not all of them are online, and some may require you to wander along the stretch of beach to find. Food is never a problem in the area, with quite a few stalls selling fresh local seafood fried tempura style, baked or cooked the way you like it. Our group opted to split into two, staying at two different places that were a scant 2km away from each other, and well within walking or cycling distance. A gem of a find on airbnb, we fell in love with the charming place the minute we found it. Situated on an expansive plot of land that overlooked the beach, the house - part wooden, part red brick - had three spacious rooms, a comfortable living room, dining table and working kitchen. Eka’s favourite part of the house? Full airconditioning inside. The only catch was the single toilet and single shower, which meant taking turns in the morning. I solved the problem by being one of the earliest to wake up, therefore giving my bowels enough time to empty out before our long ride. Toilet time turned out to be an easy thing to manage, since the group was easygoing and had different internal schedules - pun intended. Outside there was a verandah that was the perfect spot for watching the waves, with a small pit to light a bonfire at night. There is plenty of space to park our cars and bikes, and room to run around if you are traveling with children. For what you pay for (less than the current rm400 price per night when we booked the place in February 2018), it’s quite worth the money, especially if you’re in a big group or on a budget. Billed as The Land Of Palaces, the resort is actually a conservation and restoration project of the Terengganu Malay Classic house, featuring 29 antique hundred years old traditional wooden homes. It is the brainchild of Alex Lee, a local Chinese Peranakan who wanted to preserve these beautiful homes that became unpopular once the British arrival in Malaya in the early 1900s saw a shift in architecture towards the colonial style. The layout of the enchanting resort is inspired by the 17th century Terengganu Palace and its surroundings. The 20 restored villas however cost a pretty penny, and can only accommodate up to a maximum of three people, with an extra mattress charge for the third person in the room. If you want luxury though (or a honeymoon), this is the place for you. 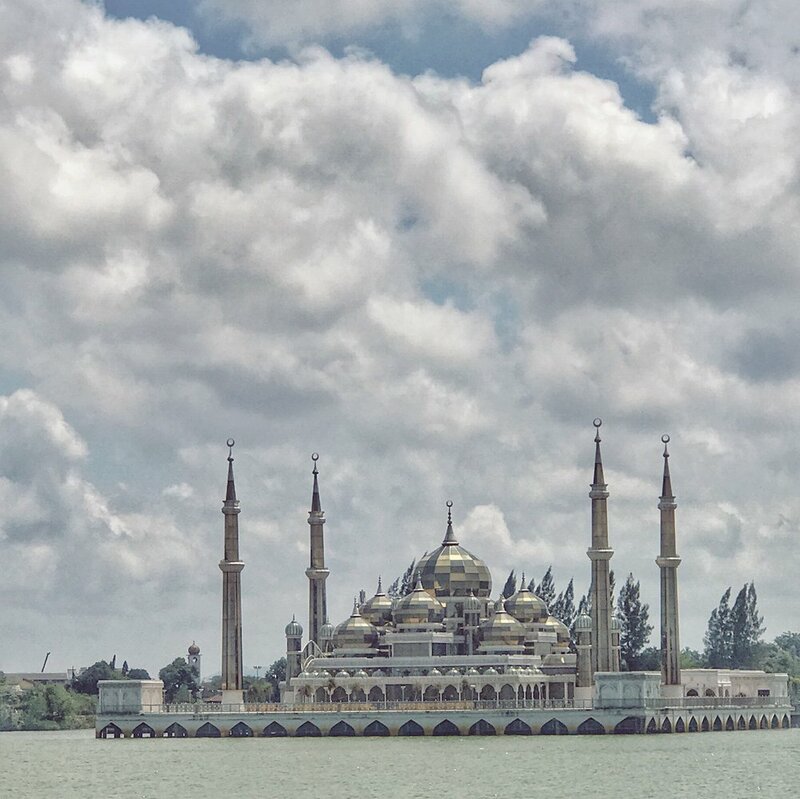 Terengganu is well known for being the home ground of Malaysia’s cycling greats, the most famous of which include the likes of Azizulhasni Awang and Anuar Manan. Even our favourite triathlete Rupert Chen hails from Terengganu, and proudly declares himself an ‘Anak Ganu’. Cycling there we truly understood how this came about. 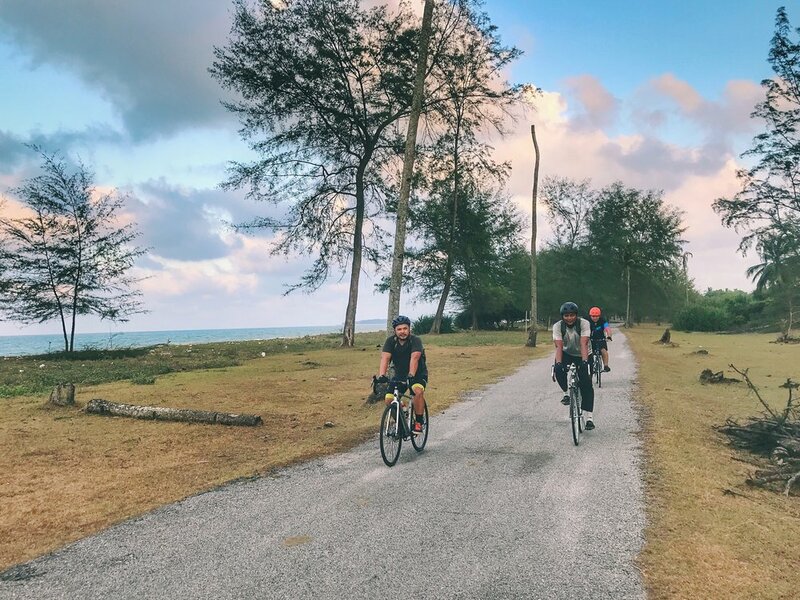 Terengganu’s roads are long, exposed to the sun and coastal headwinds, providing the right conditions for a perfect training ground for cyclists. Perhaps the local pride in homeground champions is what has led to the behaviour of the motorists there, who are courteous and ever willing to give way to cyclists crossing their path. 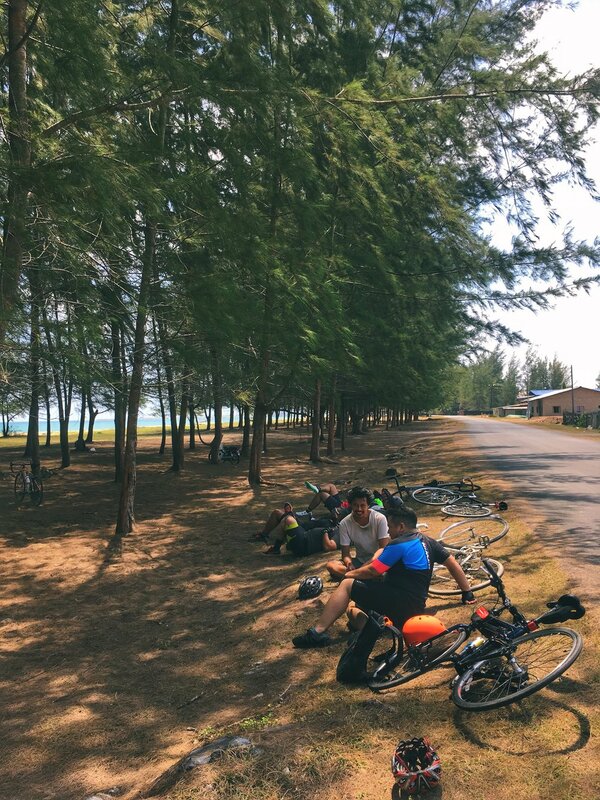 Traffic is not quite non existent in Terengganu, yet you can spend many hours riding there in relative peace without worrying about the risk of sharing the road with motorised vehicles. 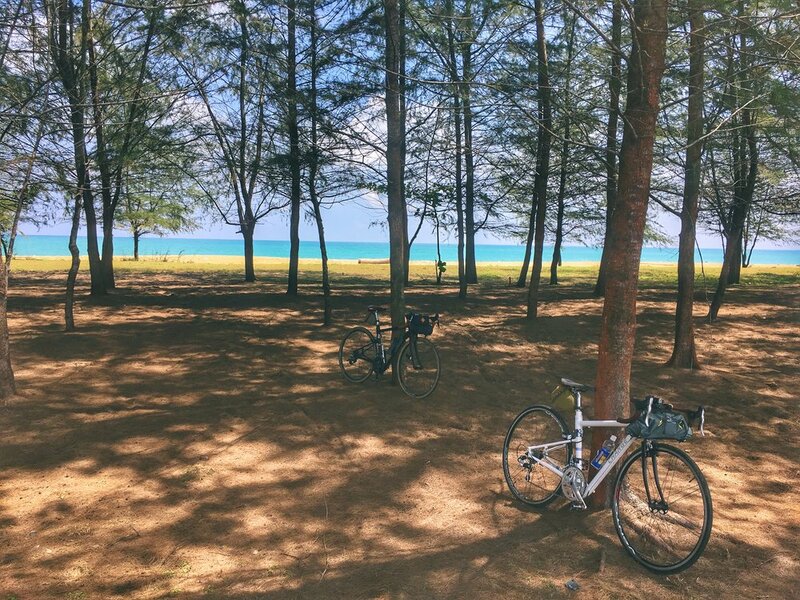 As cyclists, we highly recommend Terengganu - it is a great place to have a quick mini cycling break from the city.